Yay for November. You've got to love the fall colors, the giving Thanks, and the crazed writers manufacturing massive word counts for NaNoWriMo. And it's finally not hot in Texas. Notice I didn't say cold, or even cool, just not hot. But that will do for now. "An Agent's Inbox" Contest - The awesome Agent's Inbox contest is now releasing the name of the agent before the start of the contest so we can see how well do at personalizing our queries! Very cool. This time it's Taylor Martindale of Full Circle Literary. In this contest, the brave entrants have their queries posted on Krista's blog and the agent publicly shares her opinion. You may also win the ever valuable full or partial request. Only 20 entries are accepted and the entry window opens on 11/14 at 10am EST (9am CST/8am MST/7am PST). Only for YA, MG, & women's fiction. Love YA Contest with agent Carrie Pestritto - On 11/16 at 10am EST (9am CST/8am MST/7am PST), post your one sentence pitch and first 250 words as a comment on the official contest post. The winner gets a partial request. YA only. J.A. Souders Book Deal Celebration Extravaganza - To celebrate her first book deal J.A.Souders is giving out tons of prizes, including a query critique and critique of the first 50 pages of your manuscript. Congratulations J.A! Contest open until 12/5. inkPageant Query Critique Giveaway - You can submit 3 helpful posts from other people's blogs and 3 from your own to the community blog inkPageant in November for a chance to win a query critique from the staff at Jolly Fish Press. Check out inkPageant even if you're not querying. What a great way to increase your blog audience! Light Up the Library Auction - This is an auction benefiting the library at Musana Children's Home in Iganga, Uganda with lots of critiques and other writing opportunities you can bid on. The Great Critique Group Matchmaking Service - Fill out the questionnaire and Lynnette Labelle will help you find your critique partner soul mates. With the Great American Smokeout coming up on November 17th, I wanted to do my part to reach out to the people in the writing community who want to quit. If you know a writer who smokes and wants to quit, please pass this along. If you're a writer who smokes, there is a good chance that for you writing and smoking have a special relationship. Perhaps you smoke at your computer while you write. Maybe you take smoke breaks while you write to help you think. Or you "reward" yourself with a cigarette after finishing a chapter. Any of that sound familiar? Use a nicotine replacement therapy like the patch, gum, or lozenge. It can help reduce or even prevent withdrawal symptoms and keep your brain firing on all (or at least most) synapses while you quit. Plan ahead. Setting a quit date is more effective than just randomly throwing out your cigarettes on a whim. When you're planning your quit date, don't pick a date two days before a big deadline. Try and find three days where your brilliance can take a day off. And no...that's not an excuse to delay your quit date indefinitely...just use some strategy. Keep a beverage with you at all times - water, coffee, tea, soda, anything that you can bring from hand to mouth. Try it with a straw for the sucking action you get from smoking. Use a straw, cinnamon stick, toothpick, candy cane, carrot stick, Twizzler etc. to mimic the smoking action. Good old regular chewing gum can go a long way. Bonus Tip: If you smoke at your computer, you would benefit from breaking this habit before you're facing the stress of quitting completely. Set a quit date in the future, but stop smoking at your computer before that date. You can still smoke, but just never while on the computer. This way, when your quit date comes, you'll already have that habit managed. Or just pace around your house. That's what I do. Have your characters quit with you. Almost any reminder of smoking can trigger an urge while you're quitting. You don't need to be slogging through line after line of your MC taking a drag off his ever-present cigarette. Get those cigarettes out of your story if you can. If the setting or character really needs smoking, have them cut back. Once we know they smoke, you don't need to remind us every page. Final word of wisdom. Quitting smoking is very hard, but it's easier than getting a novel published. If you can get a rejection and not give up, you have what it takes to quit smoking. Both processes go like this - Try. Fail. Learn from mistakes. Try again. Repeat as needed. Using a support program can greatly increase your chances of success. Call 1-800-QUIT-NOW to reach the Quitline that serves your state or use this tool to find out about programs available through your employer, insurance, or state of residence. The ideas represented are my own personal opinions and not endorsed by or affiliated with any of the organizations listed. In general, people shouldn't act like book characters. Way too much conflict. We'd all lose our jobs, our marriages, and probably our lives...because real people actually die in fiery explosions. But in our writing journey, it wouldn't hurt to act a little more like heroes. I started thinking about my own heroic writing tale when I wrote this post. I was reminded of a brief section in Writing the Breakout Novel by Donald Maass (check out my review of his companion workbook here) where he asks the reader to think about their own personal stakes. He says, "In writing the breakout novel, it doesn't matter what purpose motivates you. It matters only that you have a purpose. Without it, your novel has little chance of breaking out. Its stakes will be too low." That section really resonated with me. The story of a person writing a novel works great as a heroic tale. The goal is clear. The goal is hard to reach and a happy ending is not guaranteed. The goal is not likely to come easy. There is lots of internal and external conflict to grapple with. And plenty of room for a flawed but heroic MC (yep, that's you). Why are you writing this novel? This question comes from Maass's book. In my opinion, one of the best answers is, because I can't NOT write it. If you're truly passionate, not writing the book is not even a viable option. If I stopped writing this novel, why would it matter? This one is also from Maass. Obviously, it's normal to have some non-heroic answers here, like 'I wasted my time' or 'I'll have to admit to my friends that I couldn't do it.' But that shouldn't be the whole story. Stopping writing the novel should feel wrong a deep level. What are your personal stakes? Don't be afraid to admit that they're high. That's a good thing. What is your antagonist? What stands in the way of you and your goal? Are you being beaten by the bad guys? Come on now, hero, that just won't do. Heroes aren't beaten by the bad guys. You wouldn't expect your MC to reach their goal without facing lots of obstacles first. Guess what, the same is true for you. Don't stop when the going gets tough, your MC wouldn't. Are you being a hero? A hero keeps their eyes on their goal throughout the whole novel. Are your eyes firmly on the prize? A hero never gives up, never surrenders. What about you? Of course, life is far more complicated than a novel, but personally I believe that you can and should live your life heroically. All you have to do it set goals for yourself and never give up. P.S. 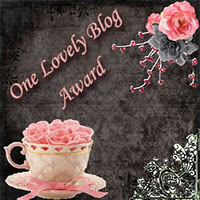 Thank you to Alex at http://magpiewrites.blogspot.com/ for the One Lovely Blog Award. Check out her lovely blog too! The last time I needed help with a query, I posted on Agent Query Connect which is an awesome website, but not for me. I got so much conflicting advice, I went into a query-hysteria induced coma for four days. Okay, maybe not. But this time, I'm asking a small group of writers I know and trust to help out instead. And there is no one smarter than blog people (i.e. people who read and and write writing blogs). If you have a few minutes that you wouldn't mind spending critiquing my query for THE CHARGE, a YA science fiction novel, please comment. I would be very grateful, and more than happy to return the favor by critiquing your query, synopsis, or short story. My writing journey is a fairly common tale of girl meets story. Girl meets story. They spend late nights together and have many beautiful moments. Girl daydreams about story while she should be working, cleaning, keeping son from climbing up bookcase, etc. But girl and story also fight frequently and break up a few times. Girl feels that story refuses to commit to a genre. Then finally after years of the swooning and heartache roller coaster, girl and story finally understand each other and love each other for who they are. Now the girl is ready to introduce the story to her parents (aka agents)....but what will they say? Girl fears that they will say story isn't a practical choice. Possibly handsome and charming, but not marketable. Impossible to shelve. But after years of trying to change story to make him more appealing to the masses, girl decides to love him for who he is and damn all else. The moral of the story is that although you should do everything within your power to understand your market and define your genre, the most important thing is making your story the best version of itself. Understand what your story is supposed to be, be able to articulate it to others, and love the hell out of it. Then have a little faith.